Teams honor ALS Ice Bucket Challenge pioneer Pete Frates. 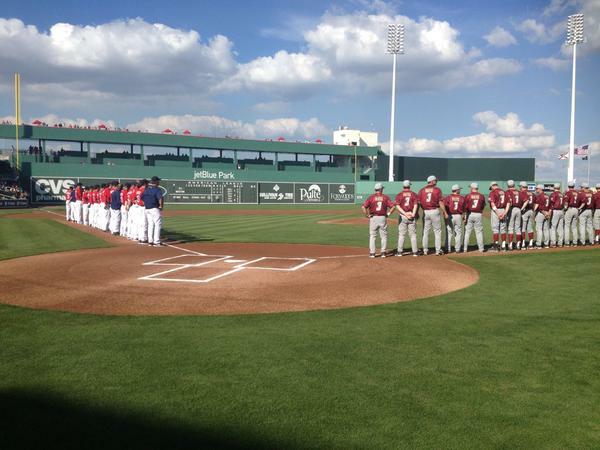 FORT MYERS, Fla. – The Red Sox played two exhibition games on Tuesday against Northeastern University and Boston College. In the second game, both the Red Sox and Boston College wore No.3 “Frates” uniforms to honor the pioneer of the ice bucket challenge, and former Boston College baseball player Pete frates. But most of the starters only played in the first game against Northeastern. Sox starter Clay Buchholz looked sharp in his first appearance of the spring. He capped off a perfect 1-2-3 1st inning with a strikeout. David Ortiz went 0-for-2 with two strikeouts. Hanley Ramirez proved he’s still got those quick hands when he hit an absolute missile off the monster in left field for a single. The Sox wouldn’t score until after the starters were taken out — but they won game one 2-1 in extra innings. They also beat Boston College 1-0 in the second game.